The Gray's River watershed has been managed since 1905 for a single purpose - to produce forest products. The pursuit of this goal has led to the clear-cutting of a total of 98% of the original forest. As a result, the age and community structure of the forest has been changed to suit the economics and technology of the timber industry. Although well-stocked with trees, the present Gray's River forest consists of a patchwork of young second and third generation timber stands (Figure 25). The majority of forest resources of the Gray's River watershed are at the point where they consist of seedlings, saplings, and pole sized trees. Modern forests are managed to allow for continually harvesting a volume of timber, driving the practice of harvesting younger trees as soon as they reach a minimum size (Davis 1996). This kind of shortened harvest cycle grows out of the viewpoint that it is uneconomical to wait for trees to reach maturity and that they should be cut before they have reached a maximum average annual growth. Since the average tree harvested is progressively younger and smaller, younger timber stands have lower volumes per acre and therefore require larger acreage for harvest. Harris (1984) estimates that the annual acreage required to produce a given amount of timber can be five times as great when dealing with young stands vs older stands. We have documented the past forest condition and evaluated the current situation. If the future state of Gray's River forest can be predicted from the past 50 years of timber harvest there is one clear trend: the forest will never return to the original state under present cutting regimes. This fact leads us to the question: "what will the Gray's River watershed forest look like in the future?" The pattern of future forest development depends on harvest rates. The watershed's future timber supply potential may be estimated by the age that individual stands are allowed to grow to before they are cut (Philip 1994). The future patterns of timber harvest can be affected by the amount of land taken out of production as a result of regulation and preservation. How harvest patterns are influenced by future protection of these and other species in the Gray's River watershed is presently unknown. 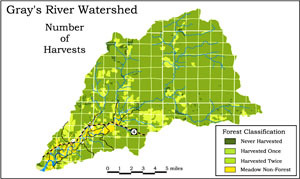 This chapter concludes with a look at the disturbances resulting from the increased rate at which the forest is being repetitively cut, and the effects the disturbances are having on the watershed. Any plan for the future of forestry within the Gray's River watershed must involve sustainability: matching harvest with the natural availability of the resource and the forests ability to regenerate itself. There are other values and activities suitable for a place like the Gray's River watershed, provided that these areas are identified now and designated for that purpose. To achieve this, a future forest plan must regulate land use in accordance with the best use for the long-term benefit of the environment and the economy. A sound future plan must limit logging to areas where logging will not impact the capacity of the land to support other objectives. The plan must involve the identification and stabilization of potentially hazardous slopes to reduce mass wasting. No-cut zones must be established so a larger percentage of the forest is allowed to grow old. The preservation of some acreage of large old trees in areas around the watershed will help to bring back some of the natural forest characteristics that have been lost. Only through these methods can we begin to speak of protecting soil, timber, fish, and wildlife. We have focused on cutting patterns in the Gray's River watershed over the past 100 years, but what about these patterns for the next 100 years? The inventory data presented in the previous chapter provides information that is needed to not only better understand the present situation, but also to make more informed decisions affecting the future of the forest. The conditions for which timber forecasting are made possible rely on several assumptions. If we assume that logging will continue in the Gray's River watershed based on the availability of merchantable timber, then forest clearing becomes a function of stand rotation. Forecasting the stand age from a present state to some future state involves modeling the stand rotation, making it possible to determine the availability of certain stands for harvest. Stand rotation is not part of the natural cycle of forest growth, but a decision made by land owners used to determine the length of time it takes to regenerate a merchantable stand of trees. Some land owners see this duration as the minimum amount of time required to get a return on an investment, others see it as a way to invest over a longer term. If stand rotation is assumed to be associated with a pre-determined forest management strategy, then there are several possible outcomes. Three scenarios are examined that project what will happen when the existing stock of timber is cut in 40, 60, and 80 year cycles. These cycles are selected in recognition of the reality of how harvesting has occurred and the patterns that have been established. To help understand how a tree's age is translated into timber volume, Table 3 lists values commonly used in the timber industry to estimate the volume of wood obtainable per tree based on seral stage. Table 3 Standing tree board foot volumes - Doyle Rule: Number of 16-Foot Logs (adapted from Ashley 1980). The 80-year rotation shown in Figure 26 reflects a management strategy that considers protection and preservation of the forest ecosystem. In 80 years the trees are given the time required to reach the late mid-seral stage of forest growth. These trees are approaching a state where their ecologic value to the forest is increasing, but past the point where their economic value has peaked because their annual growth rate is slowing (Norse 1990). According to Figure 26, the 80-year rotation would return the forest to a state that includes late mid-seral stage stands of trees. By the year 2050 (Figure 27) 50% of the forest would consist of 60 to 80-year old trees. Forest clearing would reach a peak in the year 2060 when yearly harvest levels would exceed 1,000 acres per year. By the year 2100 (Figure 28) 70% of the forest would consist of trees greater than 40 years old and within that 20% would be late mid-seral stage. Given the chance, the 80-year rotation forest would have the ability to provide a diverse age forest while supplying a steady volume of high quality timber from the year 2020 through 2100. For this scenario to occur, an immediate reduction in logging is necessary for the next 20 years. However that reduction need not occur immediately if the timber open to harvest in 2020 is clear-cut in moderation. In either case, the percentage of late mid-seral forest in the watershed would increase proportionately after harvests are scaled back. The 60 year rotation represents the high end of the average rotation rate presently used in the forest industry. In 60 years the trees would be given the time required to reach the late mid-seral stage of forest growth shown in Figure 29. The trees would be at a state where their economic value is greatest because the trees are cut when their annual growth rate is maximized (Franklin 1993). According to Figure 29, increasing the present amount of late mid-seral forest in the Gray's River watershed is possible using 60-year rotations. Under this scenario, by the year 2030 15% of the forest would consist of late mid-seral (Figure 30). These trees would provide a volume of high quality timber from the year 2020 through 2100. By the year 2100 (Figure 31) 50% of the forest would contain trees aged 30 and above. Clear-cutting would peak in 2040 and again in 2100. The third scenario shown in Figure 32 exemplifies an intensively managed forest with the use of a 40-year rotation. In 40 years the trees would be at a point where their economic value is just reaching maturity. According to Figure 32 increasing the amount of late mid-seral forest is possible using 40-year rotations with present stock. With a 40-year rotation, the forest would maintain levels of mid-seral forest at 20-30% beginning in the year 2000. This forest would provide an ample supply of 40-year old timber from the year 2000 through 2100 reaching peaks in harvest in 2010, 2050, (Figure 33) and again in 2090. This scenario would provide an immediate economic return because the present level of logging the oldest existing trees would increase to the year 2100 (Figure 34). Should we log the landscape just because we can, or preserve it and use it in the best way possible? A forest plan that uses the land for purposes other than logging would give the depressed forest environment time to recover from the past one hundred years of intensive logging. To preserve an area for a specific activity other than logging would also preserve it for the natural environment. Several writers (Pyle 1988; Norse 1990; Rajala 1997) have noted that once the forest has been removed in a watershed, the watershed's ability to serve other purposes is reduced or eliminated. The natural environment, including the forest growing environment, must be protected and diversified into areas other than forestry or it becomes vulnerable to the adverse effects of a single use. Established private forest preserves have served an increasingly important role in establishing permanent no-cut zones in the Gray's River. Certain trees have been allowed to grow old because they have been purchased by private organizations. These areas include areas that contain protected species of plants (Appendix G) and wildlife. In addition, forest land containing old-growth or threatened and endangered species are now being identified and taken out of timber production. In 2001, land acquisition for these purposes amounted to over 1% of the total land area of the Gray's River watershed. The three harvest scenarios presented herein detail how different approaches to timber harvesting can potentially change the age composition of the forest in the next 100 years. They do not tell us which management strategy will prevail or how repetitive harvesting will affect forest growth. If forests are to be managed as a crop rather than an ecosystem, then profit will continue to determine the clearing patterns and frequency. The fastest return on investment assumes that more land will be cleared with a greater frequency. If the timber industry decides to maintain the intense harvest practices of the past, the growing environment will continue to be stressed. Given these factors, it is clear that it is necessary to look at the impacts repetitive clear-cutting is having on the watershed. Certain landforms are highly susceptible to mass failure. These areas must be identified, especially high hazard and moderate hazard landforms. Hazard areas must be properly evaluated and protected from the cumulative effects of past, present, and future timber harvest activities. One of the long term results of clear-cutting is that the soil environment of the watershed has been profoundly affected, changing the growing conditions for the trees and in some areas reducing the soil's ability to regenerate a forest (Norse 1990). Slope failure features have become a predominant part of the landscape (Figure 35). Soil erosion effectively re-distributes soil from steep banks to lower, more stable parts of the watershed. The movement of soil from upper slopes to lower slopes is not reversible. As a result of soil disruption, the area suitable for forest growth and the overall health of the watershed are both reduced. High and moderate hazard unstable slopes have been identified as comprising on average, 18% of western Washington forest areas (WADNR 2000). In the Gray's River, 12% of the total surface area contain moderate to high slope hazards. 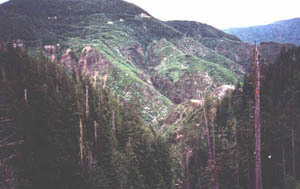 These slopes contain a combination of steep, wet, and weak conditions where soils are especially vulnerable to erosion associated with clear-cutting. This situation is further exacerbated by the high precipitation levels in the watershed, ranging from 80-120 inches/year. Figure 36 illustrates the variability of soil stability within the Gray's River watershed. Soil within the Gray's River watershed are derived from marine sediment, basalt and landslide deposits. A geological cross section (Figure 37a) illustrates the relationship between the soil and the underlying parent material. Steep hillsides, located at the headwaters of the watershed that once supported forest growth, have lost soil after logging of the forest. The soil has simply washed off the slopes of the steep hills, exposing the parent materials beneath. Figure 37b illustrates one example of an area where the soil washed off the hill slopes, exposing areas of silt and sandstone substrate. Roads into forested areas have been historically constructed on unstable slopes with inappropriate construction methods. Many of the roads built before the advent of the Forest Practices Act have been recognized as potential hazards to forest resources as well as transportation. While the most traveled roads have been maintained, many old roads built to support specific logging operations have been abandoned shortly after project completion. Abandoned roads are seldom used for commercial purposes because of poor surface conditions, steepness of grade, and slope instability. Road location, drainage, and maintenance are important features of road design, but the biggest contributor to road-related failure is time. In time, gravel road surfaces wash away, promoting the development of rills and gullies. The legacy of past road building practices can be observed on the steep slopes of K-O Peak on the Gray's River Watershed (Figure 38). Studies show timber-associated road building activities have led to increased slope instability and erosion. 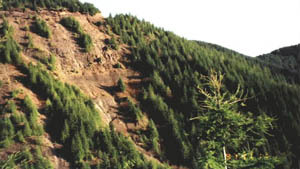 A 1999 DNR unpublished report on 380 miles of forest road in western Washington found that landslides were identified in half the survey areas, with some delivering large amounts of sediment to perennial streams. The study also determined that individual forest roads have the capacity to exceed sediment input by 40 times over the natural background level and that 65% of the survey area had direct delivery of sediment from roads to streams (WADNR 1998). Newer road construction and engineering design has reduced road-related landslides and surface erosion relative to roads constructed 20 or more years ago (WADNR 1998). The improvements are due to designs that increase drainage capacity with the use of control structures such as cross drains, ditches, and larger diameter culverts. The improvements also include the use of vegetation to stabilize slopes and control erosion. In the future, foresters must continue to seek innovative solutions to problems associated with timber production. Foresters must look at the effects of logging on the entire watershed and face the challenge of living with the potential of limited forest productivity. The health of the forest will be affected by the physical condition of the growing environment. Activities that have the potential to cause disruption to the growing environment must meet the most stringent standards, minimizing the effects of surface erosion, reducing problems associated with surface water flow, and stabilizing chronic erosion areas. It is impossible to have a strategy to objectively manage all the values of the forest unless we first know what is there (Norse 1990). The data presented here contain the kind of forest history information that can be used to assess the present, past, and future states of the forest in the Gray's River watershed. Information resources like this make it possible to identify existing old-growth forest resources and protect them for the future. This project represents a small contribution to our understanding of a larger network of drainage basins found along the shorelines of the west coast of North America. These basins need to be inventoried, compiled and integrated into a single database of forest history. The documentation of the Gray's River forest history demonstrates a single application based on resources and technology available for all the forests and basins of western Washington. This inventory can serve to provide agency employees, local government, local communities, and the timber industry with much of the information necessary to make more informed decisions about the forest resources in this watershed. Data like these increase awareness of forest trends, ensuring that decisions affecting the forest are made wisely, and with knowledge that the technology exists to fully document the effects of those decisions. Regulating the timber industry over the last two decades has not resulted in sustainable harvest levels in the Gray's River watershed or western Washington. Too much attention has been focused on keeping the timber industry viable and not enough attention has been placed on keeping the forest sustainable. The reality of the situation is that both the timber industry and the forest environment will continue to suffer until we find a way to assure that future timber harvest activities are practiced in harmony with the natural landscape.